Alden Ehrenreich as Han Solo in Solo: A Star Wars Story. 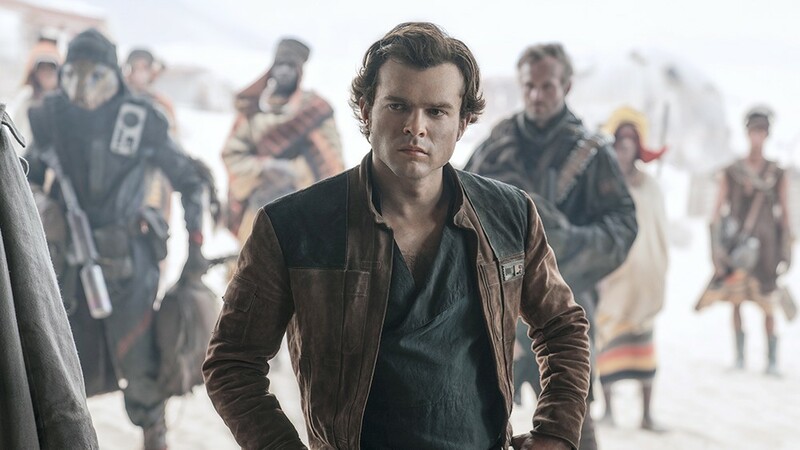 If you dispense with the notion that 28-year-old Alden Ehrenreich is playing a "young Han Solo" in Solo: A Star Wars Story, the latest installment in what has quickly become a sprawling cinematic universe, you'll have a much less fidgety viewing experience. Think of Ehrenreich as a Hank Bolo or a Stan Bulbo or a Frank Grillo. Definitely don't compare his hair or his height or his voice or his little simper to Harrison Ford's. It's a fool's errand. Ehrenreich is not the Han Solo of Star Wars, and watching him give what is honestly a creditable performance exposes the folly of Disney's origin story, which was originally directed by Phil Lord and Chris Miller (the Lego Movie dudes) but was handed off to Ron Howard mid-stream after manifold tales of on-set incompetence and what Lord and Miller referred to as "deep fundamental philosophical differences" in filmmaking styles. Given the shake-up, I'd been anticipating even more sloppiness, narrative jogs and tonal inconsistency — directors obviously being in the habit of advancing personalized and often opposing interpretations of line delivery and character arcs — but Solo holds up as a story, for the most part. I thought it was a lot less bumpy than Rogue One, which everyone now seems to worship but which I thought was riddled with bad choices and, the occasional stunning moment notwithstanding, presented more like fan fiction than the meticulously plotted product of a multi-billion-dollar studio. The criminal syndicates, in this expanding Star Wars narrative build-out, are concerned with the acquisition of hyperfuel and its key ingredient, coaxium. Beckett and his crew must steal a huge amount of it for the mob boss Dryden Vos (Paul Bettany), the theft of which comprises the main action of the film. The best sequence is teased in the trailers. It's a sci-fi take on a great train robbery. Han, Beckett, Val and the crew attempt to hijack a mountainside transport shuttle but encounter a few unforeseen challenges as they do. Get pumped. It's great. It pains me to report that Donald Glover is weak as Lando Calrissian — like, super weak — and a B-storyline involving him and his robot L3 (voiced by Phoebe Waller-Bride, is one of the more bizarre and stupid elements the franchise has endeavored to capture onscreen. Ehrenreich, to his credit, plays a charming, rakish outlaw. His name just happens to be Han Solo, which is not Ehrenreich's fault! He's a lovable character. He just has zero of the moral complications and me-first pigheadedness that made Harrison Ford's Solo the adored anti-hero that he was. Han was the original trilogy's favorite character, if not the most recognizable (that distinction goes to Vader), and one of the most beloved movie characters of all time, trailing only Indiana Jones and James Bond on Empire's list. It's natural that Disney and Lucasfilm want to cash in. Han's relationship with Qi'Ra is one of the most satisfying story lines. There are unanswered questions by the film's end, and a wholly unwelcome, preposterous cameo, which invites truly scary ideas about what they're cooking up for a sequel, but Clarke aquits herself well in a complicated role and delivers perhaps the film's most memorable line. Just don't bother trying to make logical connections between the Han Solo of this film's end and the Han Solo of A New Hope's beginning.